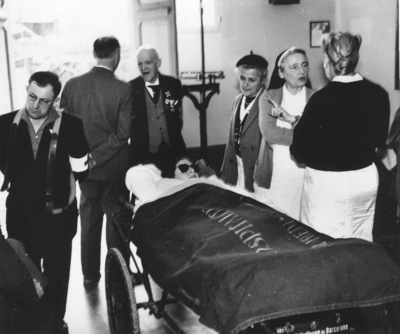 "Patient Waiting with Medical Bureau at Lourdes, circa 1950"
A patient is brough to the Medical Bureau where all visiting doctors will have the opportunity to study the case. At the left is a brandcardier,one of the volunteer stretcher-bearers whose devotedness and generosity is an inspiration to every Lourdes visitor. At the far right (back to camera) is Mrs. Winifred Feely, a volunteer assistant in the Medical Bureau. Mrs. Feely has given her past seven summers to work at Lourdes in thanksgiving for what she believes to have been a miraculous cure, though hers, like many others at Lourdes, will probably never be proclaimed a miracle.